Well, if the channels are V-shaped in section, the skinnier tires will just sit down further, so it'll fit all tire sizes. I might do two, though, because who knows. I live one of those "active lifestyles" the marketing folk like to talk about, and might have to carry two bikes at a time. I came upon a free trailer in Minnesota and I think you can guess what I'm planning. Hint: That piece of aluminum is 8 feet long. I asked around at work and found a guy to weld this thing up for not too much money. We looked at the free trailer and he thought it would be better to just start from scratch, considering the forces that will go through the long frame. I drew up some plans for the new frame, which will be based heavily on the old one, but will feature an integral (non removable) hitch arm, triangulated truss type design extended forward (but not backward, for ease of storage) and uprights above the wheels to both keep boards out of the spokes and to balance plywood/OSB on top. The uprights will support short pieces of horizontal angle iron so I will be able to bolt in 2x2" boards of whatever length or width works. 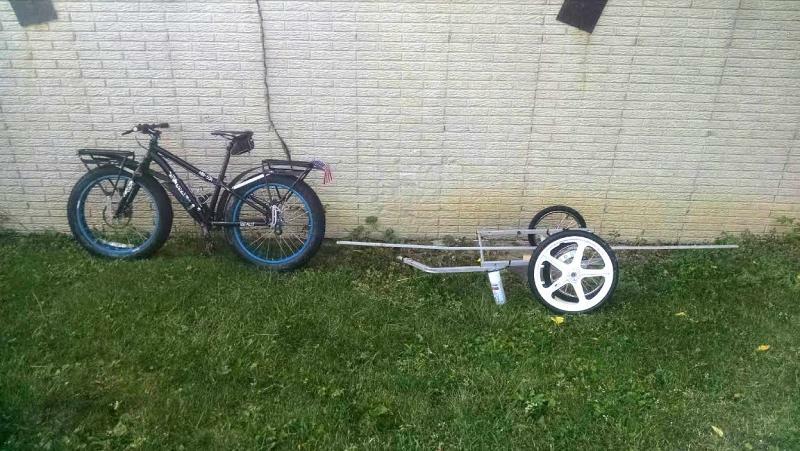 It should be pretty versatile, with the axle far enough behind the bike that I should be able to carry up to 10' long pieces of wood, metal or even a Human Powered Boat (kayak ). The great part is that I actually had a bunch of 1x1" hollow square section steel bar lying around and only had to spend something like $35 on new materials. 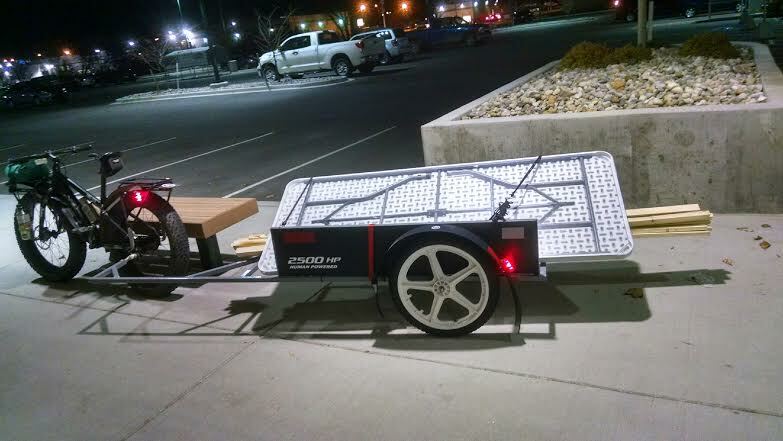 The only part of the original trailer that I will retain is the hitch, which is the hardest part to find/build anyway. 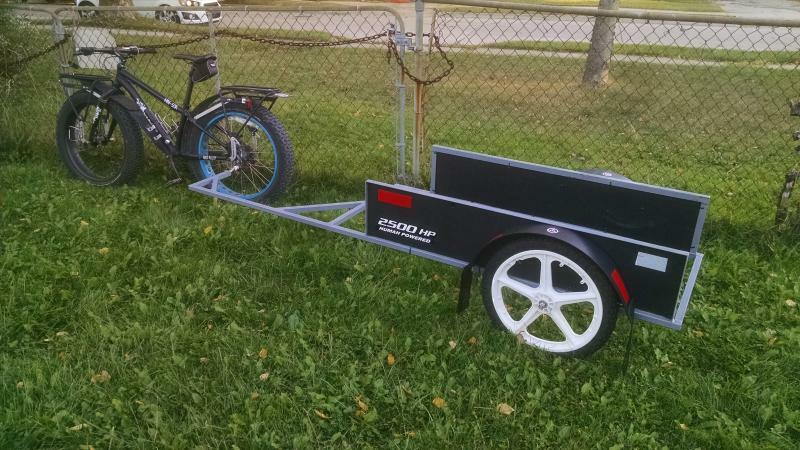 The trailer will be more expensive than I'd anticipated, but it should work well. Also, I'm not getting rid of the smaller trailer- that will get a new pair of (taller) wheels and a new cargo bed, but remain in my stable for more everyday (okay, every few weeks) hauling. 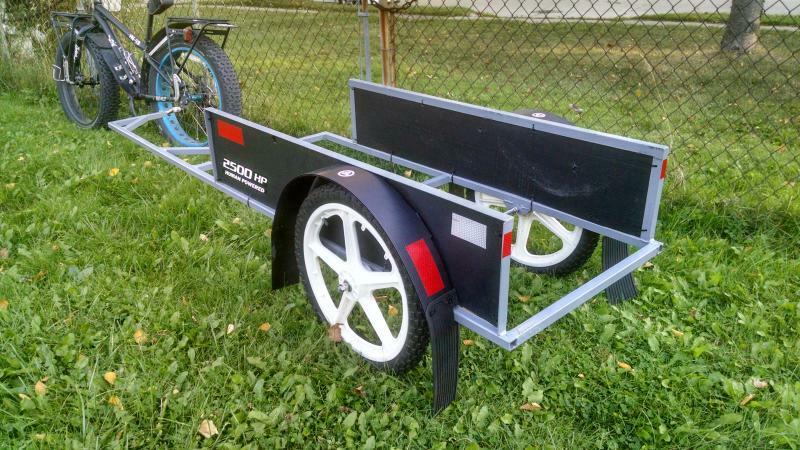 The new long trailer will be used for stuff that's anywhere from 3-10 feet long. Sorry for the novella. I'll post images when we can turn these steel bars into a HPPUT (Human Powered Pick-Up Truck). Last edited by Sven7; 08-29-2015 at 12:24 PM..
Wow, time flies. I got this totally done a month ago! My welder decided to make some changes to it, so it isn't quite what I was expecting, but it works fine anyway. I've done a couple trips with it, and am going to get some boards soon, so that'll really put it to the test. It's so long that I can just barely get around 90 degree sidewalk corners, and offset to the non drive side so much that my bike wheels are almost in line with the drive side trailer wheel. But at least I can ride around in a circle without buzzing my tire on the hitch arm. It needs a new elastomer hitch (the only thing still there from the free trailer), but otherwise is doing well. I am going to look at building a custom hitch for it though, as there is a lot of hitch flex when you have eight feet of steel behind you. The decal says "2500HP HUMAN POWERED" and is a play on the Chevy GMT800 "2500 HD (Heavy Duty)" badges. Are those mudflaps not only behind, but also ahead of the wheels? Well, the problem is that it needs to haul 8' (2.5m) or slightly longer loads. After much design deliberation, I decided that it would be much easier to have two dedicated trailers instead of one compromised unit. This thing actually stores upright indoors without hitting the ceiling, so it only takes up max mayyyybe 620 in2 (4000cm2) of floor space. My "normal" trailer's load bay actually slides right through the bottom of this so I can save another foot (30cm) or so when not in use. Yep, mudflaps on the front and back. I figured this thing is so long I'm going to get more road spray than I bargained for, and if I'm carrying something long, I want it to stay dry. Maybe I'll post my removable extended bike fender at some point to illustrate the ability to keep road spray completely off the cargo! Last edited by Sven7; 11-19-2015 at 09:55 AM..
Got some wood and a new table last night. It worked pretty well, and now I have some 2x2" boards to top the side plates, and add some eye hooks for bungees. The trailer attracted a lot of questions!